Professor Tim Leighton from the University of Southampton has been awarded a Fellowship of the Royal Society, the UK’s national academy of science, it is announced today. Each year, the Royal Society awards up to 44 Fellowships to the best scientists in recognition of their scientific achievements and is one of the highest accolades a scientist can achieve. Professor Leighton’s ground-breaking research is concerned with the way sound travels through liquids in a number of different fields including underwater acoustics, acoustics in space, animal bioacoustics, medical ultrasonics and industrial acoustics. 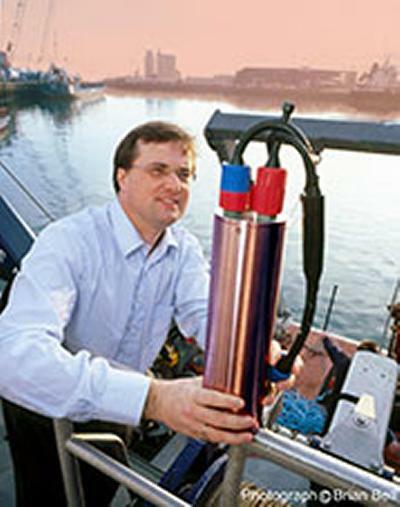 Professor Leighton’s research has improved the Ministry of Defence’s ability to predict sonar performance in coastal waters, he developed a technique for the detection of gas leaks from undersea pipelines, he invented sensors for the $1.4 billion dollar Spallation Neutron Source at Oak Ridge National Laboratory in the USA and has developed a radar system for the detection of buried catastrophe victims, covert ‘bugging’ devices and hidden explosives such as roadside bombs. Several hundred patients have now benefitted from use of a kidney stone sensor, which he (as Principal Investigator) developed in collaboration with Guys and St Thomas’ Health Trust and Precision Acoustics Ltd. His research on conical bubble collapse led to the development of needle-free injection systems and in 2011, he shared the Royal Society Brian Mercer Award for Innovation with his colleague Dr Peter Birkin of Chemistry for ultrasonic cleaning technology, which is now licensed to several users and manufacturers in the UK and abroad. In other work, he co-authored the guidelines under which foetal ultrasonic scans are done (currently around two billion children since the guidelines were published), his discoveries on whale song are part of the standard repartee of whale tour guides in the USA and his work on extra-terrestrial sound led to a device which simulates the sounds of other worlds. Professor Leighton’s research has been recognised with a number of international awards, including the A. B. Wood Medal of the Institute of Acoustics and the inaugural (2001) International Medwin Prize for Acoustical Oceanography, awarded by the Acoustical Society of America. He was awarded the 2002 Tyndall Medal of the Institute of Acoustics, the inaugural (2004) Early Career Medal and Award of the International Commission of Acoustics and the 2006 Paterson Medal and Prize of the Institute of Physics (the citation describing him as ‘an acknowledged world leader in four fields’). Professor Leighton was also awarded the 2009 R. W. B. Stephens Medal of the Institute of Acoustics, the 2013 Helmholtz-Rayleigh Interdisciplinary Silver Medal of the Acoustical Society of America and the 2014 Rayleigh Medal of the Institute of Acoustics. In 2012, Professor Leighton was awarded Fellowship of the Royal Academy of Engineering. He is also a Fellow of the Institute of Physics, a Fellow of the Institute of Acoustics, a Fellow of the Acoustical Society of America, and has been awarded both Chartered Physicist and Chartered Engineer status. In 2013, he was selected for inclusion in Who’s Who. Two of his inventions have received major awards. The StarStream ™ ultrasonic cleaning technology won the 2012 Institute of Chemical Engineering Award for ‘Water Management and Supply’. A second invention, the LithoCheck ™ kidney therapy monitor (invented jointly with Guy’s and St Thomas’ NHS Foundation Trust in London) won The Engineer’s 2008 Medical and Healthcare Award.